In enterprise use cases, OAuth should be applied as a component of a complete API management infrastructure. It will expose OAuth endpoints, provide OAuth templates, to which APIs and existing identity infrastructure are attached, and manage tokens to control and distribute session information. 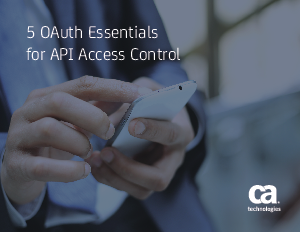 Download this whitepaper to learn 5 OAuth essentials for API access control and see how the CA API Gateway will give you all the functionality that your organization will need.